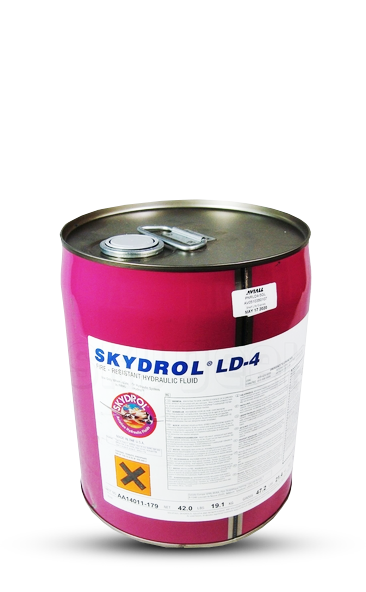 Product Safety - Skydrol fluids are phosphate ester-based fluids blended with performance additives. Phosphate esters are good solvents, and as such, will dissolve away some of the fatty materials of the skin. Repeated or prolonged exposure may cause drying of the skin, which if unattended, could result in complications such as dermatitis or even secondary infection from bacteria. Skydrol fluids have not been known to cause allergic-type skin rashes. Animal studies have shown that repeated exposure to tributylphosphate, one of the phosphate esters used in Skydrol fluids, may cause urinary bladder damage. The relationship of these results to human health is not clear. Thus, recommended personal protection measures should always be followed to minimize potential exposure. Skin Protection - To avoid skin exposure, a worker should wear gloves that are impervious to Skydrol hydraulic fluids. Some manufacturers claim “Nitrile” gloves are suitable for this purpose. Nylon latex and polyethylene “throw-aways” are also acceptable. Consult Solutia’s “Glove Facts” publication for more details. Solutia does not generally recommend the use of protective barrier creams as they do not provide complete protection. Proper First Aid Treatment for Eye Exposure - Solutia is not aware of any case of eye damage resulting from Skydrol fluid exposure, although severe eye pain may occur. First aid should consist of washing the fluid from the eye with potable tap water or a standard eye irrigation fluid (such as dacriose solution). Copious flushing is advisable. Addition of sterile mineral oil or castor oil which is approved for ophthalmic treatment to the washed eyes aids in relieving the pain. Any additional treatment would not be considered first aid and should be administered under the supervision of a physician. Where splashing or spraying is possible, chemical-type goggles should be worn. Inhalation of Skydrol Fluids - Upper respiratory tract irritation, including nose and throat irritation and tracheitis and/or bronchitis, can occur from inhalation of a Skydrol fluid mist. People with asthma may demonstrate a more marked reaction. When mist or vapor is possible because of high pressure leaks, or any leak hitting a hot surface, a respirator capable of removing organic vapors and mists should be worn. 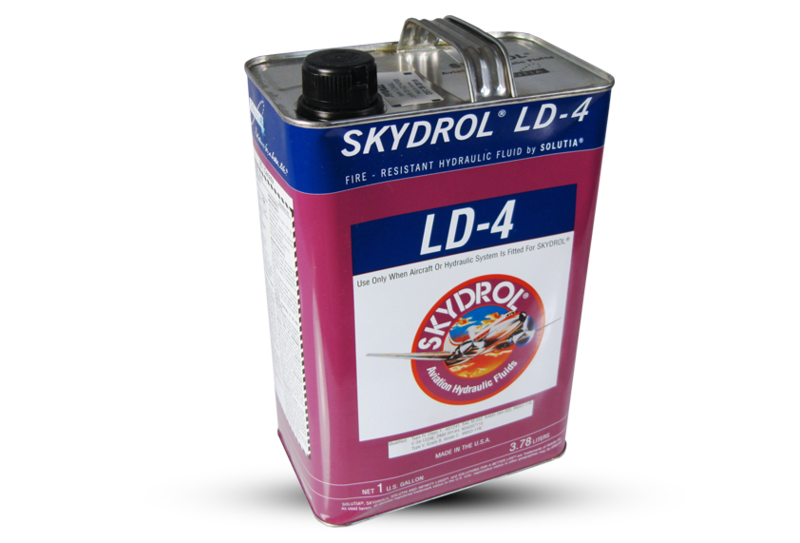 Ingestion of Skydrol Fluid - Ingestion of small amounts of Skydrol fluid does not appear to be highly hazardous. Should ingestion of a full swallow or more occur, we suggest the immediate ingestion of a large volume of milk or water, followed with hospital-supervised stomach treatment, including several rinses of saline solution and milk. • Avoid direct exposure to Skydrol fluids. a potential for eye contact. vapors and mists should be worn. Cleaning Solv - Components containing Skydrol fluid can be cleaned with non-halogenated cleaning solvents. These cleaning solvents do not contain chlorine, a serious hydraulic fluid contaminant, and should be used in the cleaning of all critical hydraulic fluid components. Although noncritical hydraulic fluid components can be cleaned with halogenated solvents, the use of such solvents is discouraged due to waste disposal problems and the possibility of hydraulic system contamination.